On the 5th of July 2017, in a bright blue building in Mandalay, IBJ brought together what are now the first fourteen members of the IBJ Myanmar team and U Hla Ko, our special consultant Senior Legal Adviser. U Hla Ko is the founder of Mandalay Law Firm, a mentor to hundreds of young lawyers and a strong advocate of the new legal aid laws. We were also honored to be joined by Mr. John Simpkins, former General Counsel of USAID and Senior Lecturer at Duke University School of Law, who offered his experience and provided guidance to ensure the successful implementation of IBJ’s four new Justice Centres. The purpose of the training was two-fold: provide a thorough orientation to our new staff members; and to ensure efficient management and delivery of legal aid at the new justice centres. While achieving these two objectives, what unfolded was so much more. Over the three-day training we witnessed open and honest knowledge sharing and bonds forming across all four centres that will ensure unity and camaraderie as IBJ undertakes this challenging and exciting adventure. IBJ’s Interim Country Program Director, Aurora Bewicke, opened the training with a warm and excited welcome to all the participants. Before moving into the core of the training, Aurora invited all the participants to introduce themselves and give the room an insight into what brought them as individuals to the law and what has now motivated them to join IBJ’s team. The team shared their inspiration from experiences of movies and detective novels, by family members and injustices they had witnessed within their communities. While all varied in their responses, they were ultimately brought together with a passion to strengthen the justice system. As the more formal elements of the training unfolded, we shared IBJ’s message and vision for justice, lessons learned on providing legal aid and building trust among justice stakeholders, and of course the expected deliverables for each Justice Centre were explained. 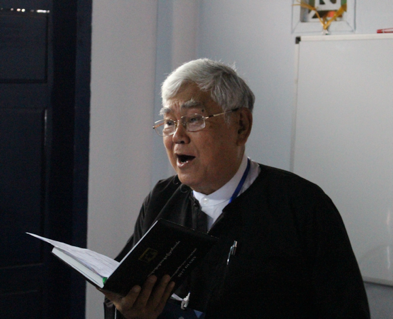 U Hla Ko shared his inspirational story and the situation and importance of legal aid in Myanmar. While John Simpkins spoke of the importance of the rule of law and how that intimately links in to criminal defence as well as the principles and intricacy of donor relationship and management, child protection and legal ethics. We also beta-tested our materials, which led to an exciting and lively debate and highlighted the different approaches and challenges that are present in each State or region. Just before closing of the second day we asked participants to spend time reflecting on how they saw legal aid delivery through their Justice Centre. 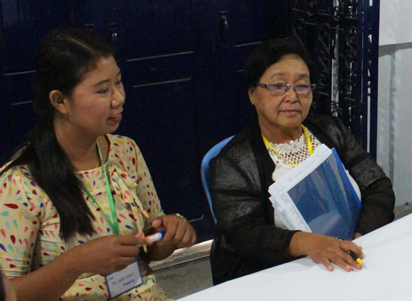 Taunggyi Justice Centre wanted to ensure that communities were aware of IBJ’s presence and address the lack of legal awareness among the poor and vulnerable. 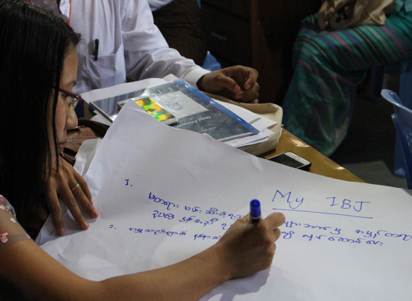 Mandalay Justice Centre sought to ensure that the youth, students and law faculties were included in IBJ’s work. Taungoo Justice Centre thought about the importance of promoting open information sharing not just among the IBJ team but also among other CSOs and organisations operating in their areas. And Hpa-An Justice Centre wanted to work and address the issues that arise from a strong military presence in their area. While the consistency of message and understanding of IBJ’s approach was evident, each group brought something new to add that made it their justice centre for their communities. 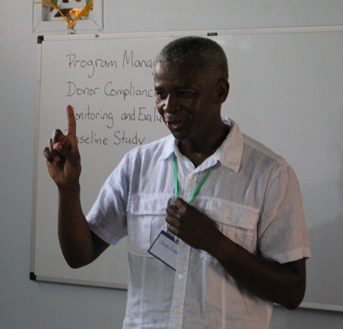 To close the three day training, Aurora asked the participants what they hoped to achieve as a result of their work both with IBJ and within their communities. She asked the participants, who until then had been seated in their respective Justice Centre team to switch places. It was evident bonds had been formed. 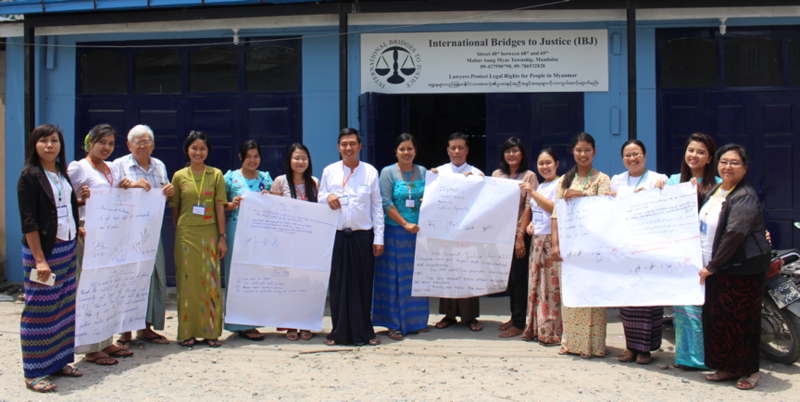 And that visions of justice, fairness and equality will move their Justice Centres and IBJ Myanmar through this challenging and exciting adventure. It was such an honour and privilege to have a room full of such an amazing team. Each and every person was inspiring, passionate and spirited. We cannot wait until the upcoming official openings of each of these Justice Centres and watch justice reform and legal aid delivery unfold. This training was provided through funding from the MyJustice grant being implemented by the British Council and funded by the European Union.